An innovative strategy has been developed to give Americans a voice on major public policy issues called "Voice of the People" created by Steven Kull. What's significant is that if given the facts, and balanced pro and con arguments on the issues, overwhelming majorities of the public can come to a consensus on issues that appear to be very polarized. A representative sample of the population at the national, state or Congressional District level are asked to be a "Citizen Cabinet" which is consulted through an online process called a "policymaking simulation," in which they are briefed on an issue and the policy options Congress is considering. Then citizens read arguments for and against each alternative. Participants are asked to make their recommendations, in a context in which they are required to deal with real tradeoffs. The issues are framed with Congressional staffers of both parties, as well as independent experts, to ensure that the options are accurate, balanced and have the strongest arguments pro and con. Republicans and Democrats have long been at odds over the climate. Therefore the Voice of the People sought to see how America might produce cleaner power. First, 6,000 Americans were asked if they favored reducing air pollution in energy production. Some 74% of agreed, along with 51% of Republicans and 93% of Democrats. Seven in 10 also said reducing greenhouse gases is a high priority, but only 44% of Republicans concurred. Next, Americans were asked if they supported an international agreement recently negotiated in Paris that called each country to cut greenhouse gases by 2% per year. Some 71% of Americans favored adoption of the 2% annual reductions including 52% of Republicans. The Federal Government adopted a Clean Power Plan (CPP) in August, 2015, which seeks to lower the carbon dioxide emissions of the country's power plants. States are asked to submit their plan to do so - or to accept a CPP of the Environmental Protection Administration. Twenty-four states balked, and sued the EPA, claiming it is overreaching the Clean Air Act. The U.S. Supreme Court voted 5-4 to block the EPA rule pending a ruling on its legality. That issue was taken to the D.C. Federal Court of Appeals, which heard the arguments in September. A decision is expected to be made in January. What does the public think of the Clean Power Plan? Seven in ten (69%) favor it, but slightly less than a majority of Republicans (47%). The public was presented with two options for mitigating the effects of the CPP on the coal industry. When asked if they favored federal subsidies to develop and build new technologies to capture and store carbon dioxide, only 44% agreed. However, 69% favored government assistance to help coal workers who lose their jobs - including 59% of Republicans. Large bipartisan majorities also favored tax credits to consumers and businesses to install fuel-efficient lighting, doors, windows and insulation - 75% of the public as a whole, including two-thirds of Republicans. Similar percentages favored tax credits for wind and fuel cell micro-turbines. When asked if they favored requiring power companies to have a minimum portion of their electricity come from renewable sources such as solar, wind and bio-gas, three-quarters of Americans agreed. Similar percentages supported raising the fuel efficiency of light cars and trucks from 2017 to 2025. However, only a bare majority (51%) favored having a carbon tax as a means of encouraging the reduction of carbon dioxide, with only 29% of Republicans agreeing. But when asked if they favored a carbon tax, provided that there were an offsetting tax credit for people with low to middle incomes, two-thirds agreed, though only 44% of the GOP. On each of these issues, the Voice of the People was not only solicited at the national level, but also oversampled in some of the 24 states that are suing EPA - Oklahoma, Texas, Florida and Ohio. What's encouraging is that two-thirds of people in states suing EPA agreed with the Clean Power Plan being litigated, and even 62% of those whose family has worked in the coal industry! The Voice of the People clearly supports most initiatives to improve environmental quality. Only the proposed carbon tax and subsidies to develop new technologies did not win support. In a highly conflicted election, when there seems to be zero agreement on the issues and much mud-slinging - it is heartening to not only learn of a process giving average Americans a voice, but that two-thirds to three-fourths of Americans agree on most answers. 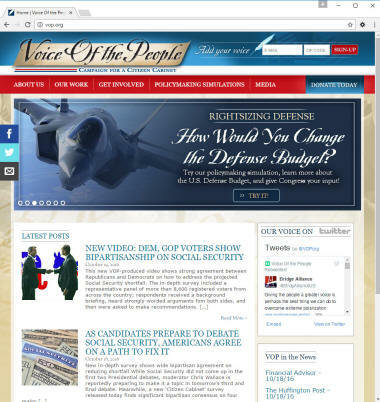 If you would like to be heard as a Voice of the People, go to www.vop.org.